Wire Gauze Packing for Extraction Process is used for the separation of thermally sensitive material, and pilot columns. Remark：X type（30o）is not of our offer. Above bulk density is calculated and have tolerance. Heavier bulk density need more cost to produce. Stainless steels, 304, 316, 316L, carbon steels, aluminum, copper bronze is available to make Wire Gauze Packing for Extraction Process. Further materials would be available on request for user. 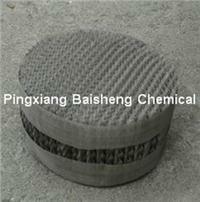 Wire Gauze Packing for Extraction Process is for fine Chemical, flavors, isomers separation. The separation of thermally sensitive material, pilot and laboratory columns. Reform existing column for increased performance.